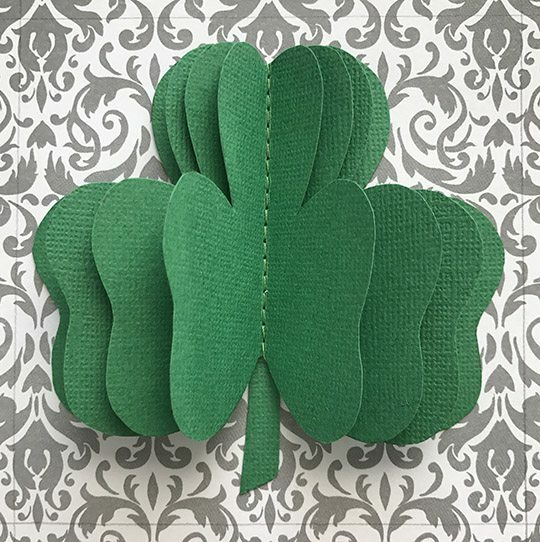 With the spring holidays coming so close together this year, I have one last St. Patrick’s Day craft tutorial to share before Easter projects take over my craft room – a quick ruffled fabric wreath with some cute little felt shamrock embellishments. 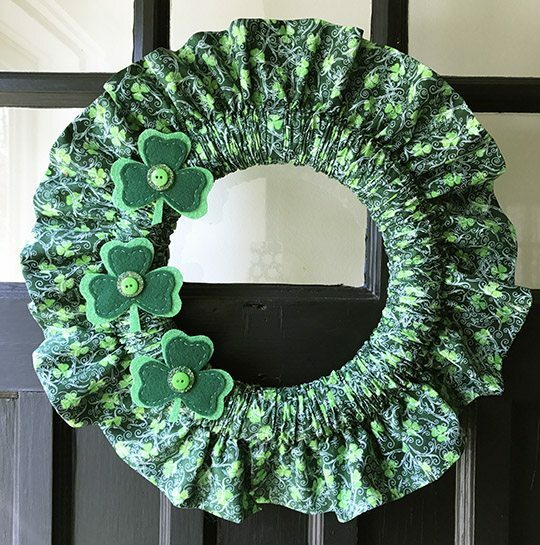 I made an Easter wreath and a St. Patrick’s Day wreath at the same time and still finished them both in an afternoon. 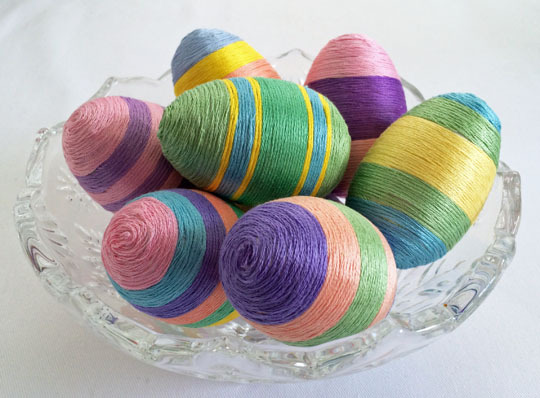 (Get the tutorial for the Easter wreath in this post. In the meantime, you’ll get a sneak peek at the fabric in a few of these photos! 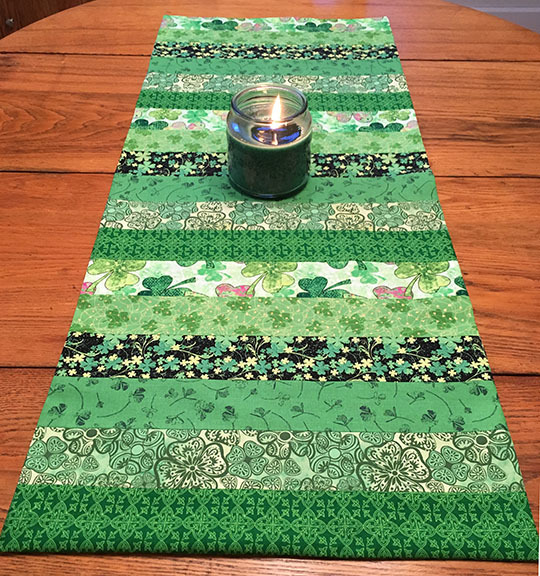 To start, cut two strips 13″ high and the width of your fabric. Sew one end of the strips together, right sides facing, to make one very long strip. 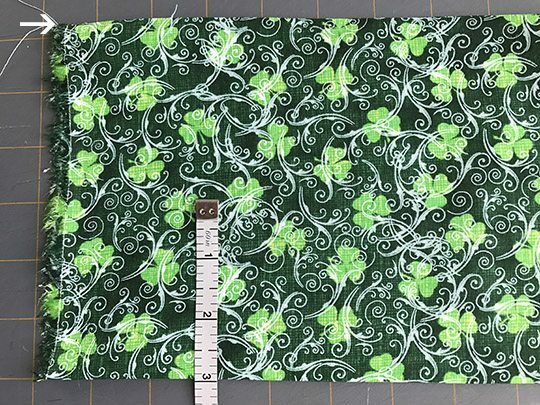 Depending on the width of your fabric, you should end up with a strip somewhere between 84″ and 90″ long. 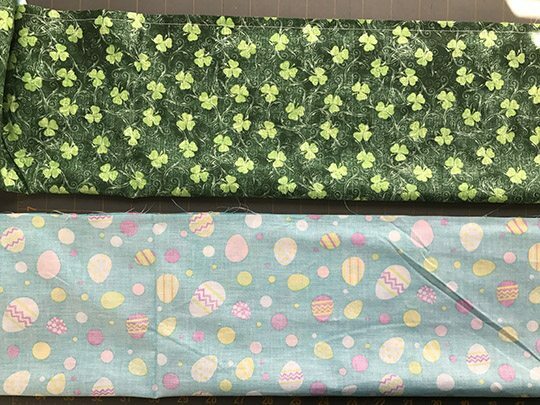 Fold the strip in half, long edges together and right sides facing, and sew it together down the long edge to make a long tube. Turn the tube right side out and press. 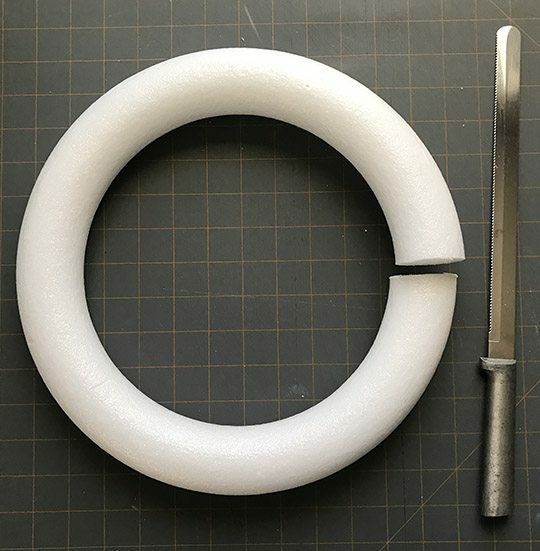 You’ll want to end up with the seam at one edge, but I found it easiest to press the tube with the seam in the center first to get it nice and flat. 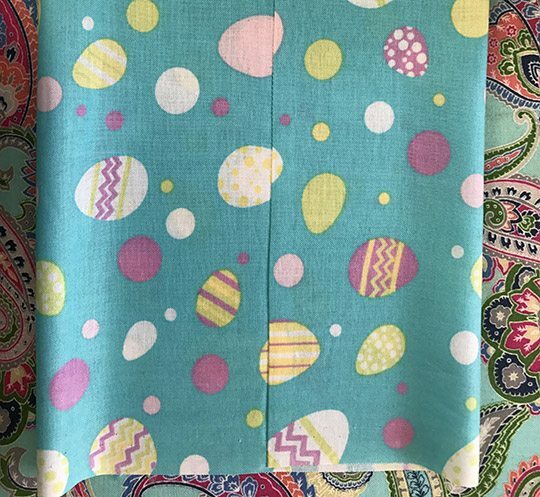 Make sure the seam in the middle where you joined the two pieces of fabric is pressed to one side, not pressed open. Then I folded it the right way and pressed again with the seam at the edge. Measure around your wreath form to find the diameter. 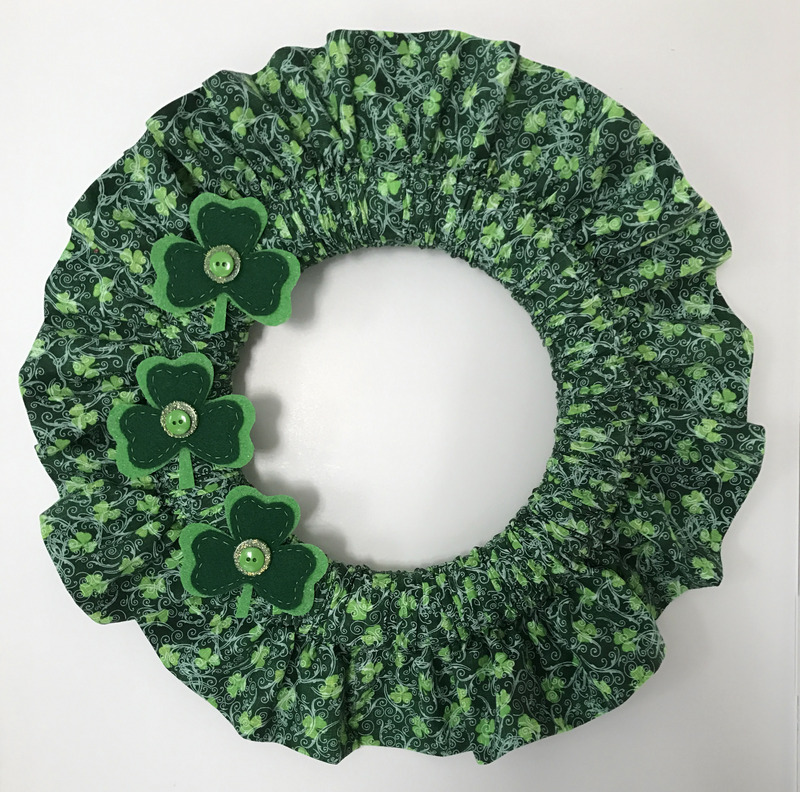 Divide that measurement in half and add 1/8″ to determine the width of the channel the wreath will slide into. 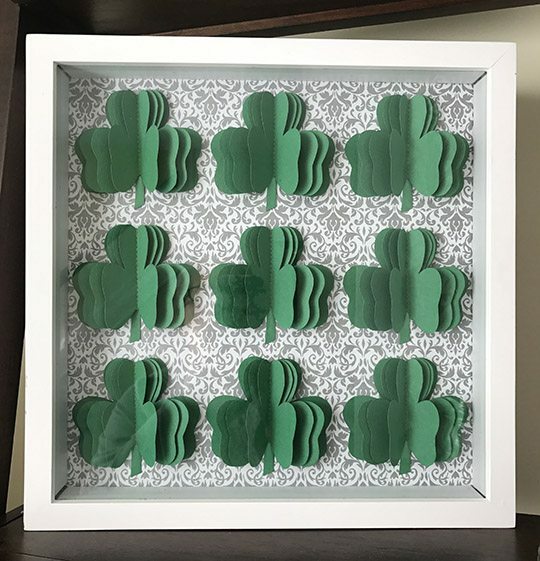 My form measured about 5-3/4″, so I needed to make my channel 3″. 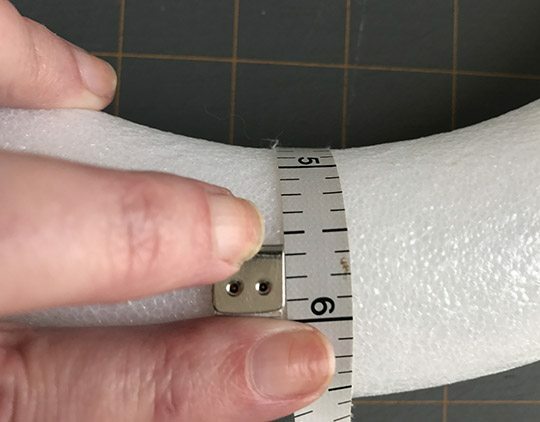 Measure over from the long folded edge (not the seamed edge) of the tube by this amount and sew a straight line all the way down the tube. 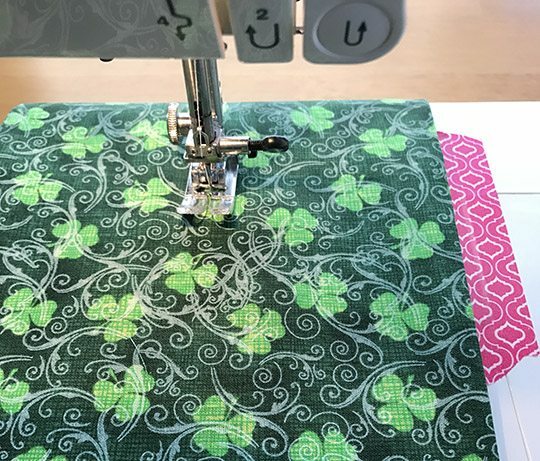 My sewing machine doesn’t have guide marks for a 3″ seam, so I measured over from the needle and used a piece of washi tape to make a temporary guide. 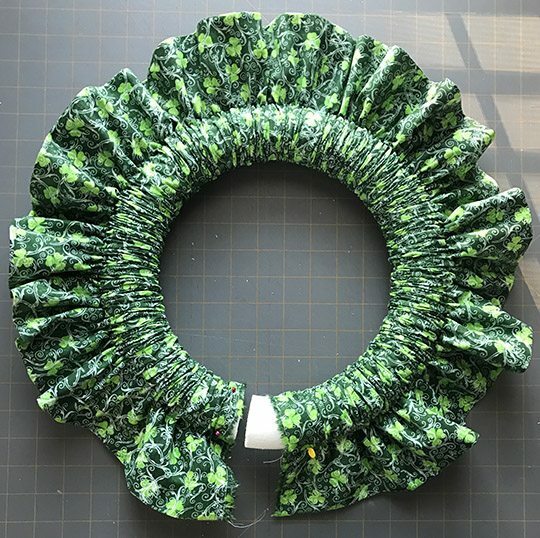 Using a long serrated knife, cut through the wreath form so you can slide the fabric on. 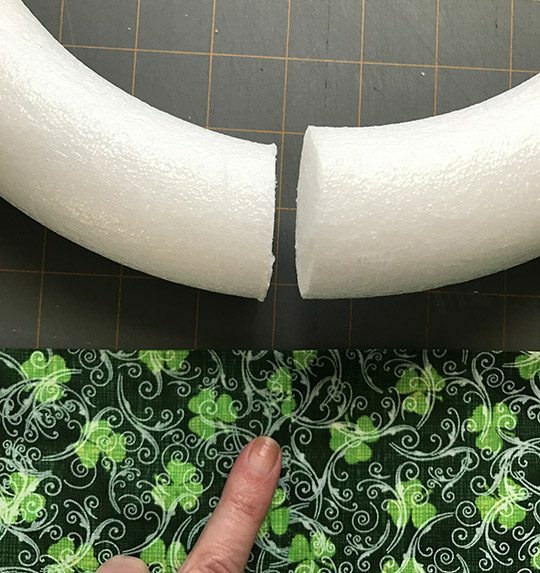 Find the center seam in your tube and note which way the seam allowance is facing. On the photo below my finger is over the seam allowance, which is to the LEFT of the center seam. 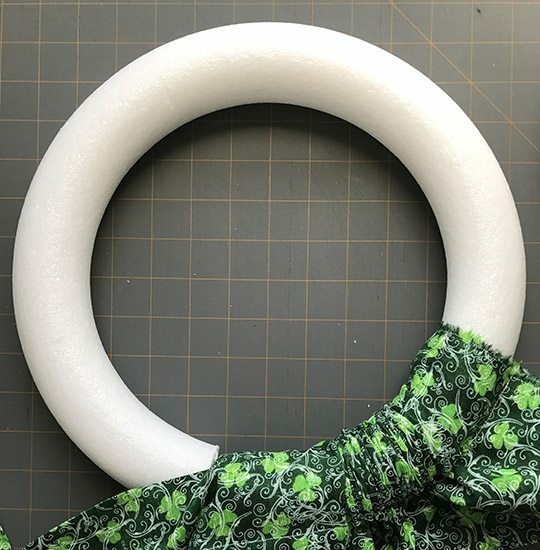 That meant I wanted to start sliding the fabric on from the RIGHT end of the tube, so the wreath form wouldn’t get caught in the seam allowance. Slide the fabric onto the tube, working it all the way around and distributing the gathers and ruffles evenly. 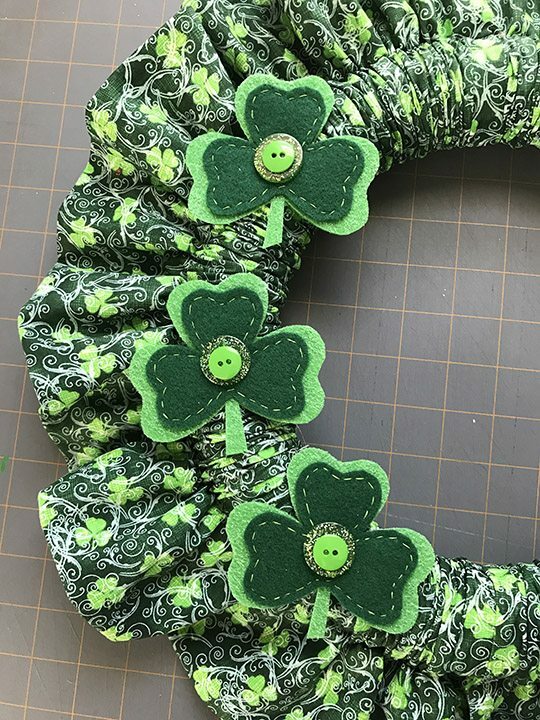 Use a few straight pins to temporarily hold the ends of the tube out of the way, and glue the ends of the wreath form together with a few generous blobs of hot glue. Hold the ends together until the glue sets. For added security, I wrapped the seam with a strip of packing tape. 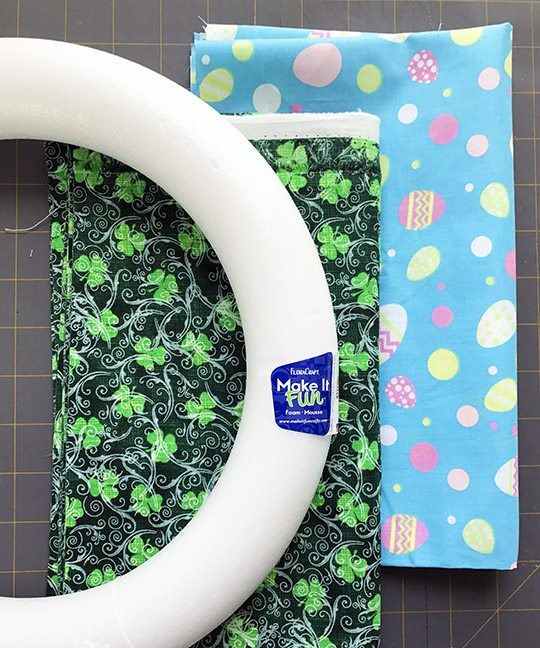 Unpin the fabric and slide the ends of the tube together to cover the seam in the wreath form. 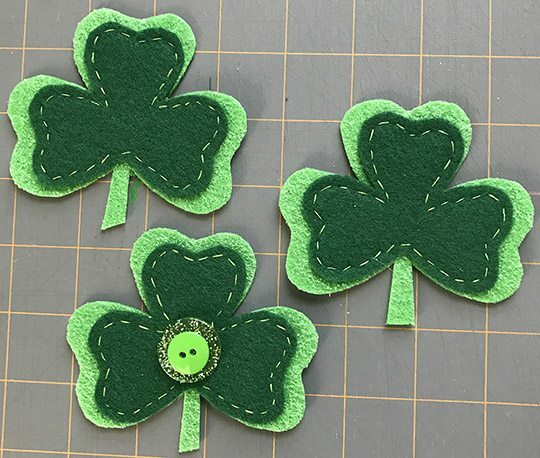 I experimented a bit with placement and when I was happy with how everything looked, I hot glued the embellishments in place. Flip the wreath over and attach a ribbon loop to the back with a straight pin. 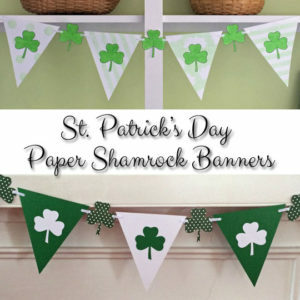 Hang it up and admire your handiwork! « Building Blocks Afghan Progress – One More Square to Go!